About.com is a veteran of the Internet age, going all the way back to 1996. And, up until very recently, it seemed that the website hadn't changed much over the past 14 years. But changed, it has. The new About.com was unveiled quietly just days ago but the change is dramatic. Instead of a cluttered, overwhelming page with hundreds of clickable options, users are presented with a very simple, clean layout with just a few options; such as "Solve a Problem," "Have Fun," and "Get Something Done." On the right is a fast, scrolling menu that lets users select from a detailed list of topics to explore. Of course, a search bar is prominent - but that's about it. From inception, About.com has positioned itself as a place to get answers. However, it also suffered from an identity crisis - the same self-inflicted problem encountered by Ask.com. That is, urging users to find solutions but, at the same time, shoving content down people's throats that they didn't ask for. 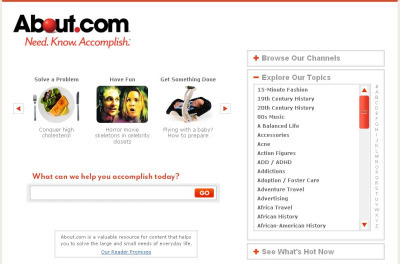 But About.com somehow managed to survive, in part thanks to its being acquired by The New York Times Company in 2005. Did I say survive? I meant thrive - to the tune of 46 million unique visitors in May, 2010 alone. The new-look About.com is tackling "search overload" head-on - a cause championed by Bing.com but one that stands to benefit About.com the most. After all, Bing is still a search engine and will always be one. About.com, on the other hand, has carved its own space among users' mindshare that does not directly compete with Bing, Yahoo! or even Google. By providing minimal distractions users are free to get directly to the content they want (not links), choosing from the more than 2.8 million articles available, written by more than 800 qualified contributors. That's good for users, and advertisers, too. Relevant content means relevant ads served up to users who are in a moment of need. To that end, About.com is making a mass appeal to advertisers. This Fall they will unleash everything in their arsenal to make their case to advertisers and marketers. From ballpark scoreboards to banners in the sky, About.com is doing everything they can to get your business. You have 46 million reasons to give it to them.